Indicator species are plants and animals that, by their presence, abundance, or chemical composition, demonstrate some distinctive aspect of the character or quality of the environment. For example, in areas where metal-rich minerals can be found at the soil surface, indicator species of plants accumulate large concentrations of those minerals in their tissues. Studies have shown levels of nickel as high as 10 percent in the tissues of some varieties of the mustard plant in Russia and as high as 25 percent in the tissues of the Sebertia acuminata from the Pacific island of New Caledonia. Similarly, a relative of the mint plant found in parts of Africa has been important in the discovery of copper deposits. This plant grows only in areas that have up to 7 percent copper in their soil. More recently, indicator species have begun being used as measures of habitat or ecosystem quality. 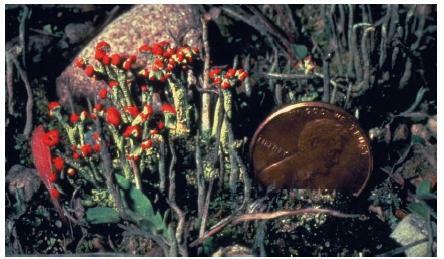 For example, many species of lichens are very sensitive to toxic gases, such as sulfur dioxide and ozone. These organisms have been monitored in many places to study air pollution. Severe damage to lichens is especially common in cities with chronic air pollution and near large producers of toxic gases, such as metal smelters. almost certain indication that water quality has been degraded by sewage or other oxygen-consuming organic matter. In contrast with most of the animals that live in an unpolluted aquatic environment, tubificid worms can tolerate water almost totally lacking in oxygen. In some cases, indicator species can be used as measures of the quality of whole habitats or ecosystems. For example, animals with a specialized requirement for old-growth forests can be used as an indicator of the health of that type of ecosystem. Old-growth dependent birds in North America include spotted owls, red-cockaded woodpeckers, and marbled murrelets. If birds such as these thrive in a particular old-growth forest, the forest can be considered to be in good ecological health. On the other hand, if the health of such species begins to decline, the indication is that the habitat itself may be in poor condition. Many governments are currently conducting research to determine which species of animals or plants can act as sentinels or lookouts for particular environmental contaminants. Through the use of indicator species, it is hoped that potential environmental problems can be identified before they result in irreparable damage. the above information are really helpful and i want to know more about bio indicators, can you help me out? ?